I am in muslin hell. I made muslins for Simplicity 2452 and New Look 6901 over the last two weeks. I hate them. And no I don’t have pictures. I would die of shame if you saw pictures. Not flattering is the kindest term I can come up with to describe the awfulness that is the state of these muslins. Let’s start the discussion with Simplicity 2452. I first made this skirt in a size 14 in true muslin. Choosing the size 14 was an exercise in futility wishful thinking. I know sizes are just numbers, but folks, I really have a hard time swallowing the fact that I am a size 16. Ok, so moving on, I choked back the tears accepted my “true” size and did another test run of this skirt in size 16 with some fabric of which I am not enamored. I originally bought this stretch cotton for my Sew Fast Sew Easy class to make an elasticized waist skirt. It’s a heavier weight (read: stiff — could stand up on it’s on) with Jacquard like stripes in an irregular pattern. It’s easy to work with but the hand is not pleasant, think 70’s polyester blend. Of course it doesn’t even enter my mind at this point that the size 16 wouldn’t fit, so I didn’t baste the side seams, I just sewed them at the regular stitch length (2.5 on my machine). I hand basted the zipper in and tried it on. All I needed to complete the picture was a cane; I looked like I was at least 20 yrs older than I am. What the?!?!??!? It fit fine at the waist, but from the hips and down past the thighs, it was poufy (for lack of a better word). Now I have to fit this size 16 to my apparently rectangular fat shape. Sounds like fun, doesn’t it? Have I done it yet? NO! Do I feel inclined to do it? NO! Will it be done? Maybe. I don’t know. We’ll see if and when I feel less bitter about this skirt. Now for the New Look 6901 muslin… I made view A the drape neck top in the pretty purple rain dress remnant as my muslin. This time I “knew” to make the size 16. First let me say that the New Look directions are great! I understood every one of the steps. The drafting is great too. So let me tell you how I managed to screw up this simple top royally. I got all fancy and decided to use my serger for the construction (not just the seam finishing). The serger was not a good choice for attaching the back neckband facing. Ask me how I know. Then I proceeded to completely stretch the back neck out of all recognition by topstitching the facing after serging it. It looks like hell. The drape on the front, however, is beautiful. After serging the side seams closed, I tried on my top. Let me point out first though, before putting the top on, it looked ginormous in my hands. Like triple XL ginormous. I was scared it would be too big. However, I didn’t realize how scared I should have been, because it fit. For the most part. It fit in the waist and shoulders. Where it did not fit was in the bust. Now, I am not of the opinion that I am overly well endowed in that region. I would say that I am a little bigger than average. I wear a C cup. That’s it. No FFF cups here. Well that top was straining in the bust area with no less than three bust wrinkles. And the drape? The drape was draped BEHIND the bust wrinkles. BEHIND!!!! What the hell is up with that?? How is that even physically possible? I can’t wrap my head around it. And in case you’re wondering, the overall look of the top on me? Reminiscent of women who wear clothes that are too young for their age. I’m not that old people!!!! I knew I had gained some weight the last two years, but I must be suffering from some sort of delusion major body dysmorphia where I think I’m thinner than I actually am. I have this picture in my mind of how I looked in 1997 and I’ve kind of frozen myself there in that year. OMG, that’s thirteen years ago! I thought it was only 5 yrs ago. Time just flies after you turn 30 I guess. Since I’ve had Jack, I’ve had this thought paradigm floating around my head that I can’t date right now. Who wants to date a woman with a toddler, or who hasn’t lost the baby weight or gained more weight as if she had another baby but didn’t have another? I can’t afford the babysitting costs required by having a social life. So in my mind why should I bother losing weight or getting into shape again if I have no social life anyway. What I hadn’t realized was just how much weight I have gained. It’s shocking to me. I guess these last two muslins have really made me look at myself in the mirror. You know how you can look, but not really see? That’s what I have been doing with mirrors since Jack was born, looking but not seeing. Looking enough to put my make up on in the morning or do my hair, but not seeing the additional weight in all its glory. I have to start working out. There’s just no hiding that fact anymore. Even if dating is not in my near future, I still need to feel good about myself. *double sigh* Ok, I will stop writing TMI and get back to sewing. I am not trying to be all self pitying right now, I am just sharing my sewing journey and a major part of sewing is being realistic about your measurements and sewing for the body you have now, not what you wish you had. Am I making sense? Not sure what I am going to work on next, but probably New Look 6807. Hope everyone else has a better sewing week than me. This entry was posted in Muslins, New Look, Personal, Sewing, Simplicity, Tops, Work Wardrobe. Bookmark the permalink. Hi! This is my first time commenting, I think. I really enjoy reading your blog! I am glad to know that I am not alone in being frustrated at times with pattern fitting. My heart goes out to you because I am in the SAME boat, only older (not a young mother). But I use to be skinny too! When I started sewing again three years ago, I was having problems with the numbers too. The way I’m looking at it now is, sure I want to lose the weight, but I just haven’t decided that I want to do the sweating that it will take yet. In the meantime, I still need clothes so I sew for where I am now, and will when I do lose the weight I’ll sew for where I am then. P.S. You do beautiful work. Hi Elizabeth, I totally sympathise with you. When we are used to ‘buying’ a certain size number and it’s smaller than a sewing pattern it messes with our heads! Having gone through it, I do know that you come out the other side and begin to understand that we’re all different sizes and none of us are going to fit into any clothing/pattern without some tweaking. I suppose there are those 1 or 2 who can, but the majority of us are normal women. So forget what size something is and just go by your own personal numbers. After all should numbers hold such power over us??? Lol. Regarding your muslins …. the skirt fits at the waist, so that’s good. Have you tried taking the seams in below the waist? Pin fit it first to see if you like the look. If not, throw it away, it’s not worth the agony. If you like the look of the skirt try making a muslin out of something more like you want to make it out of. And also, I’ve found that measuring myself, around the hips etc and deciding how much ease I want and then measuring the pattern in the same place is a good start. At least you know how much bigger/smaller it is than you. The top looks lovely on the pattern. Did it have markings of the finished size on the pattern? Did you compare it with your measurements? Did you use the same/very similar type of fabric suggested? Most of the Big 4 patterns are drafted for a B cup so if you don’t want it very fitted you may need to do some adjustments. I do feel for you, it’s not easy but you will get better and more confident too. I am in muslin hell for the same reasons, but I really want to work through it. When I sewed for myself in my 20’s, clothes fit exactly as sewn with no adjustments whatsoever, with 32″ bust. Now I am a 14 (and a 16 bottom) in pattern size and it is….. just not believable, I am still in a state of shock and dismay. But from what I am reading in other sewists blogs, even very beautifully thin people are having fitting issues of their own, so I am thinking that the fitting process is something we need to continue to work on until we get the hang of knowing what needs to be done to a pattern to get it to fit us. Then hopefully it won’t be so time-consuming. I know now that I have to cut my patterns smaller around the neck, then pinch in the waist, then bring out the hip, etc. Don’t give up! It’s worth it!!!!! Honey, it’s not you, it’s Simplicity. That skirt was born to frump. Toss the pattern and move on to prettier stuff. And don’t top stitch knits. It only makes it worse. Ouch! I can’t comment on the two patterns, but I’m with you on the experience of making something that looks great on paper but yechhh on my body. Haven’t we all? Size has nothing to do with it. Just go ahead and get some exercise and you will feel better right away. Seriously. It will blow off steam, and put this muslin episode behind you. I am not a big muslin sewer because I can’t read wrinkles and diagnose fit issues. So, why bother? I have TNT patterns that I use over and over. When I want a new style, I work out a frankenpattern, rather than try to sew a muslin from a commercial pattern. It’s just hard!! Feel better! Oh and another thing – what’s in your construction queue – that Burda cardi/jacket thing – that’s a definite no-no unless you are feeling devastatingly attractive and tall and willowy…. Sometimes the problem is the style, sometimes the “cut”, and not the (normal) body underneath it. Ugh, sorry about two failures in a row. That’s so frustrating! But I’d agree with all that it sounds more like bad drafting than anything else. I am a big proponent of exercise for the mood boost. Being snowbound this week I haven’t had my normal gym time and I am feeling schlumpy. If you can find a way, do it not for weight loss but just to up your endorphins! I think that sewing is difficult because, as you put it, you have to take inventory of everything: your finances, your current fabric, your notions, and yes, your physique. I started sewing because of my body DISproportions; my hips were (at that time) a 12-14, and my waist was a solid 4. And yes, many mouths have said that a “curvaceous” body is lovely, but I constantly felt like a butternut squash trying to secretly look like a pear. I think you are lovely, no matter what size you are. And no, I do not think you look like a 16. And yes, at my “heaviest” I was a 14-16 in Burda patterns; which was horrifying to me, as well. I hear you on the sizing issue (says the woman with 24 hips). We have to remember size really is just a number. The point of sewing is that if you make it right, you’ll look great no matter what the size. Sewing makes you so cognizant about your body. There is nothing wrong with getting a workout in when you can. I have learned that no food taste as good as the feeling of sewing my own clothes that look good on my healthy and fit body. I have been there, done that so many times!! I can fit and sew for anybody else with beautiful results. But when it comes to fitting and sewing for myself – well, lets just say it’s not usually a very pretty picture. And sizing? I just wing it these days! Street size, I’m usually a 4. But when I go to make something, the measurements on the envelope say I’m a 12. When all is said, sewn and done, I’m usually a 10. Go figure. The only person I know who fits the patterens perfectly is my 18 year old daughter. AW . . . remember when . . .
You know, underneath all the stuff about your size there is that disturbing comment about “not expecting to date” for some time, which we are all politely ignoring because it is so worrying. After a few days of leaving it, i thought it might be helpful to chip in. As an ex-single-parent (i.e I did marry later), may I say that the sooner you pick yourself up off the floor and stop accusing, convicting and punishing yourself, the better? You don’t have to be whippet-thin to be lovable and loved. Look around on the sewing blogs – all those non-whippet-thin ladies with DHs. And then look at Kate Moss’s love life! Forgive yourself your weight, your singledom, whatever is making you feel bad. I was slender when I became a single parent (left the hospital in my size 10 (US size 6) jeans) but several sizes larger when I married my now DH. There’s no connection between weight and love life. Stop judging yourself in that way. Sewing sizes are all whacked out, I think everyone can agree with that 🙂 I love your blog! Just the other day I picked up a bunch of patterns at a sale and have some of the same ones you do! I’m a total beginner, I just started sewing over Christmas so I’m a strugglin a LOT more than you! It can be QUITE frustrating, but always a learning experience, I guess! I know I am late in responding to this post, but I thought I would as you alluded to it in your most recent post. I have been frustrated with sewing and fitting many times when working with wovens – the short answer is, it’s the pattern, not you! Some patterns are just not well drafted or are drafted for a totally different (mythical) figure type. I go into a new pattern not expecting it to like it. I know that sounds defeatist, but it keeps me going on to the next pattern. I think Sandra Betzina says in one of her books that if you don’t love the muslin, stop, don’t waste another second on it, and throw out the pattern. I follow this advice. You should have seen this one dress I muslined the other day from Butterick Fast & Easy – I tell you, most of their Fast & Easy patterns are the kiss of death, and this was no exception. My husband told me it looked like I was wearing a burlap sack. How’s that for a comment? I didn’t let it get me down because again, I know it’s not me, it’s the pattern. Hang in there! On another note, have you tried working with knits? It can be a short cut to avoiding fitting problems. And I’m not sure I agree with the other poster about negative ease not working in general – I think it works very well for knits (and knitting) but it needs to be the right design and fit the upper body/shoulders well. I just had to chuckle, but I know what you mean about getting all excited and in the mood to pick out a pattern and go home and look optomistically for something you created (sewed) only to find out it has not turned out right for you, to say the least. I have not seen you, but in reference to the “NewLook” pattrn for starters, you may need to get a a ”plus size” pattern and this way, you can take in what you need instead of falling short. I looked at the pattern and they look very young like for a size 12 gal. Should you be a full figure gal, then you definately need a plus size pattern. We all find out , however, there have not always been a lot of plus size option patterns until recently. 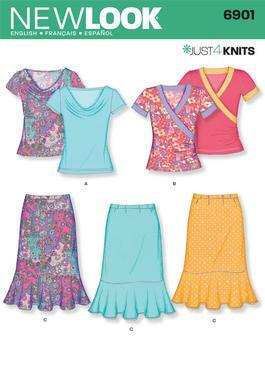 From these patterns, you can alter them by lengthening skirt length and create different looks from just one pattern of a skirt. Happy sewing anyway and keep going, sewing is definately an adventure.